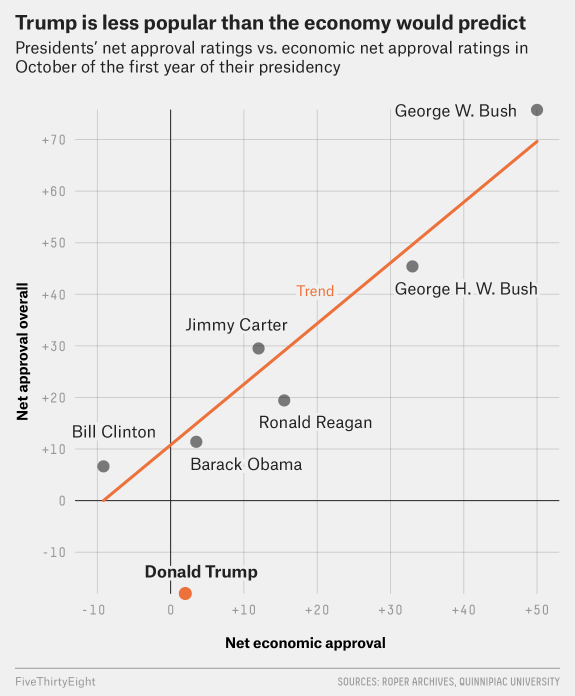 One of the lesser oddities of the Trump era is that the president and his party have managed to achieve historic levels of unpopularity — even as the unemployment rate has fallen to a decade low, and the stock market has soared to all-time highs. Few presidents have enjoyed such favorable, first-year macroeconomic numbers — and none have suffered such unfavorable political ones. This is largely a testament to the extraordinary toxicity of Donald Trump’s persona, and the heinous unpopularity of his party’s policy priorities. Americans actually give Trump’s handling of the economy a positive approval rating — but dislike his handling of the presidency, nonetheless. Still, there may be a separate, secondary explanation for why Republicans have failed to benefit from presiding over a good economy: That economy isn’t nearly as good as the past year of jobs reports and stock tickers would have one believe. All “full employment” economies aren’t created equal. And there’s long been reason to think that our current one is less golden than gilded. 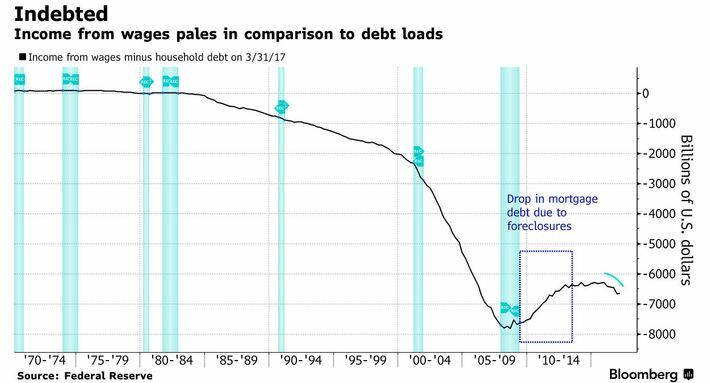 As I’ve previously noted, we’re living through the weakest recovery in postwar history — one that’s left the prime-age labor-force-participation rate near decade lows, underemployment above pre-recession levels, and wage growth too tepid to compensate for mounting household debt. 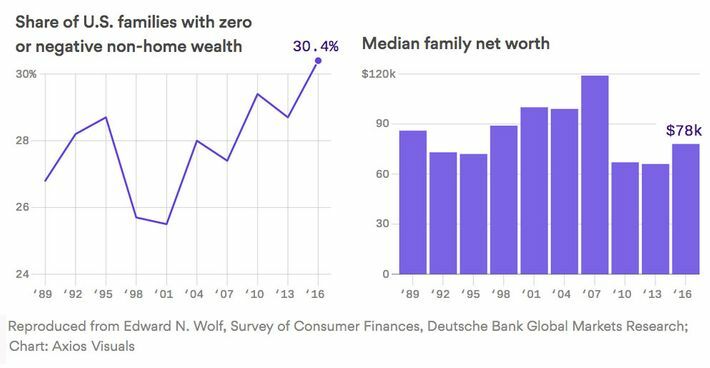 Now, Deutsche Bank economist Torsten Slok has added two new, (profoundly) disconcerting data points to the pile: The percentage of families with more debt than savings is higher now than at any point since 1962, while the median American family’s net worth is lower than it’s been in nearly a quarter-century. So, this is what a “good” economy now looks like in the United States: shrinking household wealth; soaring middle-class debt; wage growth that can’t keep pace with the rising costs of housing, health care, and higher education; job growth concentrated in part-time positions; widespread retirement insecurity; and more wealth-less households than America has seen for 56 years. And contra Trump, there’s reason to think that this is about as good as things are going to get. Job growth in 2017 was weaker than it was in 2016, when it was weaker than it was the year before. Expansions don’t last forever. Americans’ perception of their economy tends to be based less on its absolute strength, than the direction it’s moving in. But the absolute strength has to matter some. 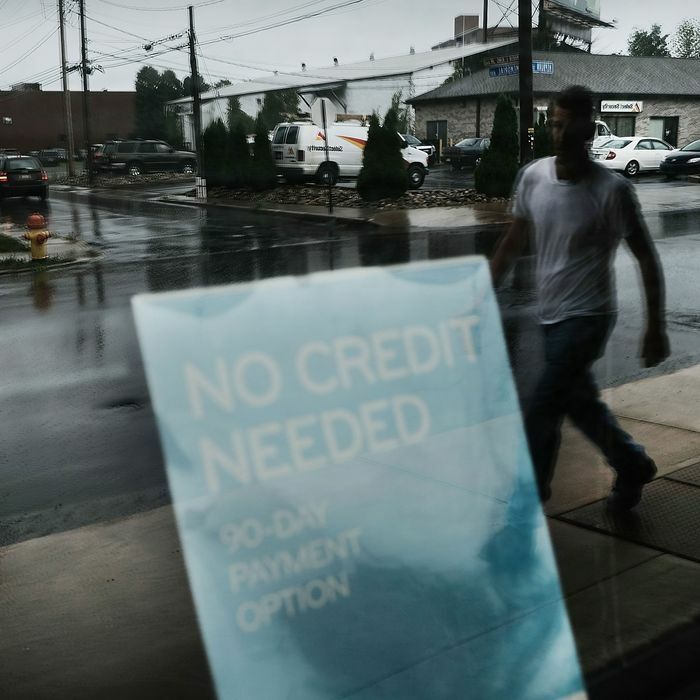 The fact that this might be the worst full-employment economy America has ever seen is probably a (small) part of the reason why Trump is the least popular “full employment” president our country has ever known.